About three weeks ago I bought Yvonne a new digital camera due to me dropping hers on the concrete..she is now the owmer of a new Panasonic DC-FZ80 camera. Anyway this same store had a sale on, and most importantly with permission from the wife I enquired about video projectors. Out came this little Epson EH-TW5600 full HD, very nice I said to the salesman, and asked the cost. I am not sure if it was the fact we had just bought a camera, but the discount price was really good. Hopeless eh!..anyway after making my own ceiling mount etc I got it up and running, and boy its impressive. Ran the blu-ray of JAWS tonight and with the settings on Eco..and Cinema, plus setting the Frame Interpolation to normal I could not believe what I was seeing. Incredible image detail, something I had never seen before, not even on film. I am sure I could read the small print on the bottle of wine they were holding in the movie. The colors were excellent as well, but its the image enhancement with fine detail that wins out big time on this Epson. For a entry level projector it offers excellent value for money. The lamp life is about 4000hrs and on Eco is 7500 hrs. I certainly found the Eco setting bright enough. I am looking forward to trying out the 3D later on, as the Pioneer Blu-ray player I am using is 3D as well...just need some second hand glasses. I have a few 3D blu-ray titles already bought over the last few years. We've been pretty pleased with our Epson 730HD. The image is bright, even in Eco mode, and pretty sharp too. Projected about 5 foot by 9, I see a slight screen-door effect if I stand within about two feet of the image, which is way too close anyway. -I already had enough little audio modules! That's the thing with most blu-ray players these days, as all the sound is by the HDMI cable for TV use. I looked at a device in a electrical shop that could extract the sound from HDMI, but that item costs over $100 dollars, so gave that idea a miss. The Pioneer player I use has audio out for both left and right, plus optical at the back, which is a must for my amp does not cater for HDMI. One thing about video projectors these days, is how cheap they are to buy, compared to years ago, plus a huge improvement in picture quality. When I watched JAWS last night, I was only about 8ft from the screen but the image detail, like small stuff on the screen was truly amazing, something I had never seen before which really brought the viewing experence to a new level. It's only about 30 bucks(US). The only difference for you is you'd need one that plugs into your power. You made the right decision there Graham. 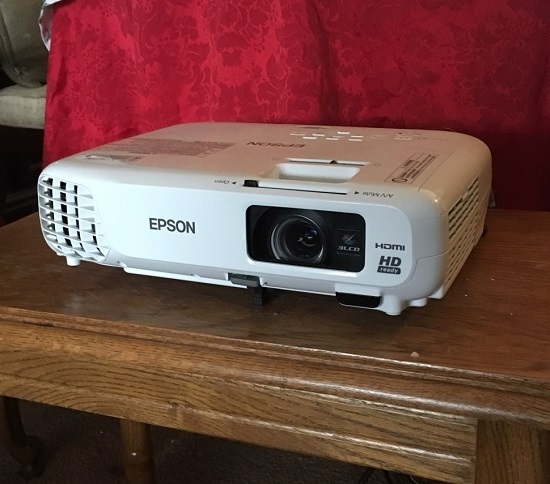 Home digital projectors have come a long way since you purchased that Sanyo, and IMO it would not be worth spending the money for a new lamp. 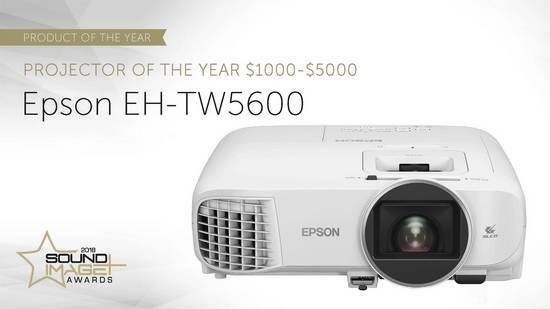 Epson is a great company and they make great projectors. I recently set up an Epson 310 in my daughters house and the picture is amazing. Honestly as good or better than the professional digital cinema. The Epsons produce beautiful images. Just make sure you check the air filter regularly and/or replace it. Unlike DLP, the LCD light engine is completely exposed, protected only by the filter. If even a tiny particle of dust gets into the light path or onto one of the panels, you'll see red, green or blue blotches on a black screen. If that happens during warranty, get Epson to swap it out. They have a good advance replacement scheme. A few years ago I bought from a pet shop those stretch bird cage covers that you use on the bottom of the cage. They are ideal to slip over the projector when its not in use. There were three different sizes of covers, from small, median, to large, and depending on the size of your projector, those stretch covers are ideal. Thanks, Graham. Yes, I actually have a black vinyl cover made by Visual Apex in the States which works perfectly. I originally bought a refurb Epson 6030UB three years ago, but I had to return three of them to Epson because they all arrived with dust bunnies in the light path. Eventually Epson just sent me a brand new PJ! During the week I mounted it on the ceiling, it took a bit of figuring out to get the distance just right for the acadamy and scope ratios. One thing I do notice with this Epson is how cool it runs in the Eco mode. ProjectorCentral.com gave the Epson 3100 such wonderful accolades that I was hoping Santa would bring me one for Christmas. (He didn't.) Interestingly enough, Graham, the model you bought is not on their website. Was hoping to see what it compared to among the other models. Anyway, congrats. That's way cool. These could do great things outdoors. I sit mine about 12 feet away from my 5 feet by 8 screen and have to zoom it as tight as possible to fit the image on the screen. I run it in Eco mode: I found the standard brightness was overwhelming compared to my Super-8 machines and doing a mixed format show actually makes the film projectors seem dim, even though when you watch them alone they look just fine. (These mixed shows may be a better job for Xenon based film projectors, but I don't own any). To me these facts mean there's a lot of untapped potential here. The Epson could be backed up or zoomed wider and the brightness set full and it could fill a much larger screen. If running a program mix of super 8 and digital I usually find it best to run super 8mm film first because frankly, as you said, S8 projectors (except Xenon's) will look distinctly dim if compared directly with a digital projector. Even my Elmo GS1200,with an f1.0 lens, 2-blade shutter,and ESC lamp, looks much dimmer than my Panasonic digital projector. And, lets be honest, most of the time the digital picture is going to look better. But that's not the only reason. The really nice thing about super 8 is the abundance of shorts and featurettes available for showing prior to the main feature (be it film or digital). Cartoons, newsreels, Pathe Pictorials and Look at life's, some really incredible digests and trailers -you name it. And a lot of this stuff is just not available on DVD or Blu Ray. I've noticed the exact same thing, Paul. It's not a perception that fades within a reel either. Either you go video last or you need an intermission. Graham? Is "Train for Christmas" commonly available on 16mm in New Zealand? -I'd brave the postage for that! It used to be, but have not come across one in years, however your name did pop up when fellow forum member Pat called in a few weeks ago and we discussed getting you a 16mm print, so if one crops up in good condition its in the back of my mind to get it for you, and send it on to you at no cost. Hopefully within this year sometime a copy will make an appearance. I got it on 35mm Steve!, Graham Ill come over and look at this new toy of yours this week! Guys, that is a downright humbling idea! -but if it ever come to pass I would want to kick in some cash! To me "A Train for Christmas" is near or even at the top of the world of Railway films. -at a matter of fact, I chose it to be the very first of its kind to be screened at CineSea, and the people there enjoyed it too! Just watched the link to 'A Train for Christmas'. What a great little film. Steve, I can understand why you want a copy. Who wouldn't? Loved the bit when the driver turned the engine on the turntable. I'd need extra weetabix to even attempt it!! Bet it looks good in 35mm. Why on earth has no-one re-issued it? Reckon it would be a best seller. ** Of course the fact that I was in my twenties at the time may have helped too! Forum threads are amazing. 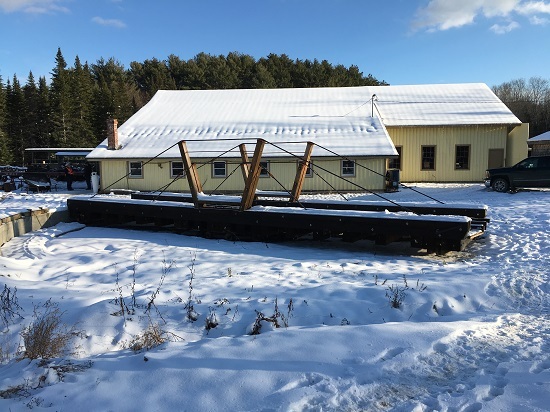 How did we get from an Epson digital projector to a railroad turntable! After watching a bit of "Raise The Titanic" I can see him getting one sometime in the future. Yesterday I played around with the settings and concluded, that the features the Epson can provide are quite extensive. I found that when setting the image processing to fine and from that Frame Interpolation to normal, the incredible image detail is really something to watch and its the setting I am most happy with. However if you want a more of a "film look" then switching the fine to off and frame Interpolation will also cease. The range of options is really amazing, they clain you can watch a 1hr 45min movie every day for 11 years on one lamp life. Time will tell on that point, but value for money its excellent value for money and to be honest I have never seen such picture detail. I watched "Earthquake" last night and "The Man Who Never Was" the night before on blu-ray, sitting close to the screen you can see everything in detail which for me is a real joy. One thing I did notice with this projector was how cool it ran, after switching it off and putting my hand on the case it only felt look warm. I printed out the user guide, the English version is 111 pages long. The poor old printer was almost worn out. Graham, one thing I have found with my Panny, and I am sure it is the same on your Epson, is that black and white films are just a little to 'cold' in appearance. So I have a custom setting for B&W films, saved in the picture menu, where I have dialed down the color temperature to get a warmer look to the picture. I like it a lot better.